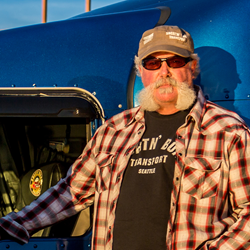 Marc Springer, star of A&E’s “Shipping Wars,” will join VXi to promote new BlueParrott products and a VIP stock car race sweepstakes at the Mid-America Trucking Show in Louisville, Kentucky. Professional truck drivers count on BlueParrott. It’s just that simple. They know our headsets deliver the sound quality they need to stay in touch on the road and be heard clearly, even in the noisiest environments. VXi Corporation will demonstrate why its BlueParrott headset line continues to be the top choice for professional truck drivers during the Mid-America Trucking Show (MATS), in Louisville, Kentucky, March 31 through April 2, 2016. The company will display familiar favorites—such as the top-of-the-line B350-XT—and introduce a new product based on the ever-popular B250 series headsets. In addition, “Shipping Wars'” star Marc Springer, an avid BlueParrott user, will be a featured guest at the BlueParrott booth (#17240), sharing news about the product line and helping to promote the BlueParrott Driver’s Club VIP stock car race sweepstakes. BlueParrott has long been the Bluetooth® headset leader for professional truck drivers—thanks to its unmatched combination of industry-leading noise canceling, clear, natural sound quality, and roadworthy durability. The flagship product of the BlueParrott line is the B350-XT. It builds on this legacy, delivering streamlined styling, 24+ hours of talk time, and cutting-edge features like the programmable Parrott Button™ that can be set to mute, speed dial and more. Other recent additions to the BlueParrott family that will be featured at MATS include Point™, a stylishly small Bluetooth headset that delivers big sound, and Wired Buds, the first in-ear headphones with BlueParrott sound quality and durability. VXi will also launch a new BlueParrott headset based on the popular B250 series. For details, stop by booth #17240. As fans of the A&E’s hit show “Shipping Wars” know, one professional truck driver who depends on BlueParrott to get the job done is Marc Springer. The owner-operator of Seattle-based Snortn’ Boar Transport, and a long-time fan of BlueParrott products, Mr. Springer will join the BlueParrott team daily at MATS to greet fans, sign autographs, and share information on exciting new BlueParrott products and promotions. As in previous years, MATS attendees can join the BlueParrott Driver’s Club. Members get BlueParrott gear, a quarterly newsletter, and may take part in new product field trials. They are also eligible for exclusive contests. For example, the “Pin It to Win It” promotion will return and give new club members a chance to win BlueParrott products during the show. In addition, VXi will launch a new sweepstakes at MATS, “The BlueParrott Driver's Club Stock Car Race VIP Experience.” The winner will receive two VIP tickets and pre-race pit passes for the NASCAR® Sprint® All-Star Race in Charlotte, North Carolina, on May 21, 2016. The prize also includes airfare, car rental and hotel accommodations. MATS is the largest annual heavy-duty trucking industry event in the world. Held each year at the Kentucky Expo Center in Louisville, the show attracts 70,000+ attendees and 1,000+ exhibitors from throughout the United States and abroad. As the industry's premier business venue, MATS offers attendees the best opportunity to research the latest products and services efficiently, gain insight into current topics in the industry, and network with attendees and exhibitors from around the world. Learn more at truckingshow.com. BlueParrott is a registered trademark of VXi Corporation. Bluetooth is a registered trademark of Bluetooth SIG and is used by VXi under license. NASCAR is a registered trademark of the National Association for Stock Car Auto Racing, Inc. NASCAR, Inc. is not a sponsor of, does not endorse, and is not affiliated or associated with this promotion in any way. Sprint is a registered trademark of Sprint Corporation. Sprint Corporation is not a sponsor of, does not endorse, and is not affiliated or associated with this promotion in any way. All other trademarks are property of their respective owners.